Etymologically the word calligraphy finds its origin in the Greek word “kalos” meaning “beautiful”. At Graphiplus, we remain faithful to this spirit, for us, calligraphie is the art of beautiful writing. The art of beautiful writing is often characterised by the style of writing but also the language used. Indeed, several languages use symbols, which gives a completely different dimension to calligraphy. When we talk about Western calligraphy, we often refer to the use of letters from the Latin alphabet. It originated when Christian monks had to copy manuscripts. This art was then considered a form of prayer because it required a great concentration. Like any art, Western calligraphy has undergone the influences of its time. Cultural influences (eg Renaissance), but also political (eg Charlemagne and Carolina) or technical with the invention of British calligraphy. To write, calligraphy artists have used rather varied technologies. Originally, they wrote using a style (more commonly called “Stylus”), designed in iron or bone for the older ones. Then some artists began to use calames, a sort of reed cut to a point. Then the nib appeared, initially made with real bird feathers, then from metal to gain precision and durability. 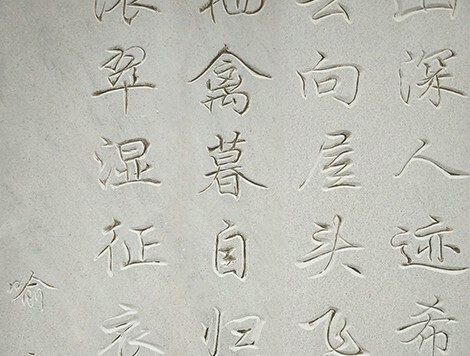 Engraving on stone or other support is not considered as a calligraphy. Indeed, this technique does not allow the use of “spontaneous” gesture which is the essence of the art of beautiful writing. Click here to discover the art of engraving (link). Looking at the history of printing and the recent history of digitalization, our company may seem incongruous, but yet it’s not ! The art of calligraphy is an art that requires years of practising, but even more than technicality it is all about soul. A calligraphed word has a soul, a typed one has none. Oriental calligraphy is divided in two broad categories : Oriental calligraphy and Far Eastern calligraphy. The first mainly corresponds to Arabic calligraphy. The second one mainly refers to Chinese or Japanese writing. 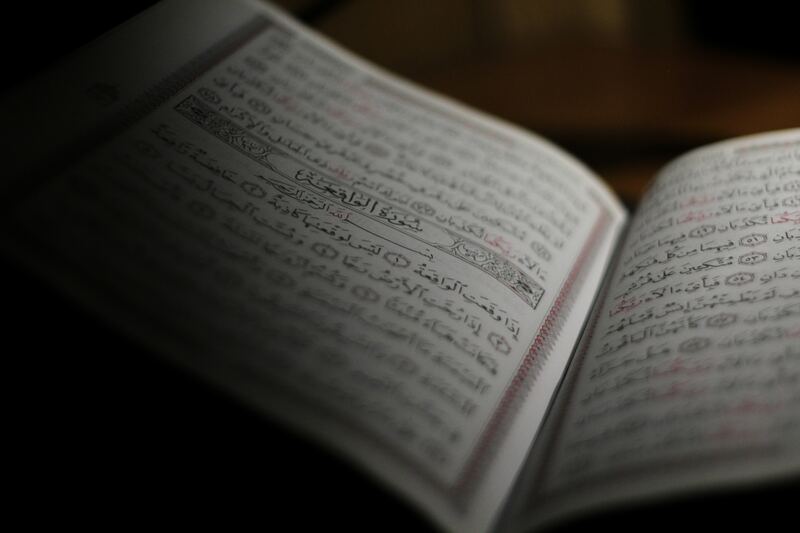 Like Latin writing, it strongly developed with religion and the early days of Islam. Calligraphy is also very often used in oriental arts, especially in poetry. Cursive writings with a very rounded form. Kufic scriptures with a very angular shape. It is important to emphasize that these scriptures have appeared at different ages. This demonstrates an evolution of this art through time and influences. 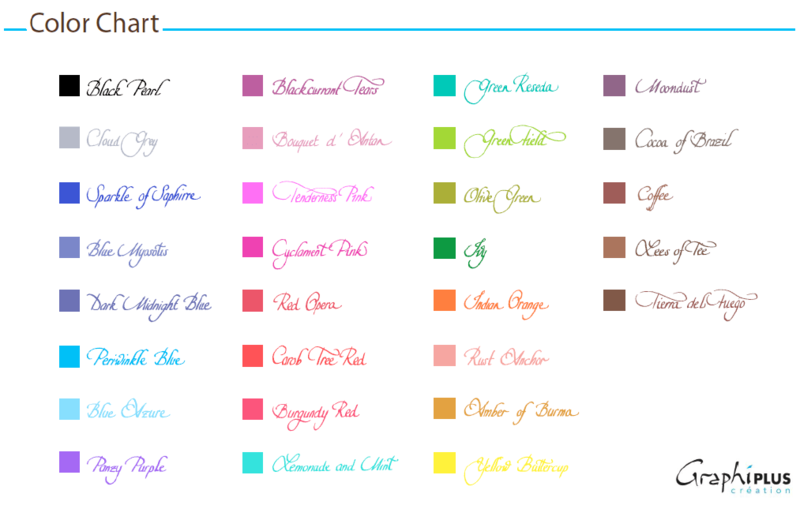 Each of these categories contains several writings styles. As mentioned above, the latter is often linked to Chinese calligraphy and Japanese calligraphy. These scriptures use the Chinese alphabet (traditional or simplified) and the Japanese alphabet that uses “kanas” inspired by the Chinese alphabet. The art of beautiful Far Eastern writing developed mainly with the Indian ink used at the tip of a bamboo carved very finley. Chinese calligraphy culture cannot be divorced from “masters” who have worked all their lives to perfect their art. The values put forward by this art are mastery as well as precision, but also creativity. From their teachings come the three great values of Far Eastern calligraphy : technical and self mastery, precision of gesture and creativity. Modern calligraphy doesn’t necessarily meet the rules of traditionnal calligraphy. 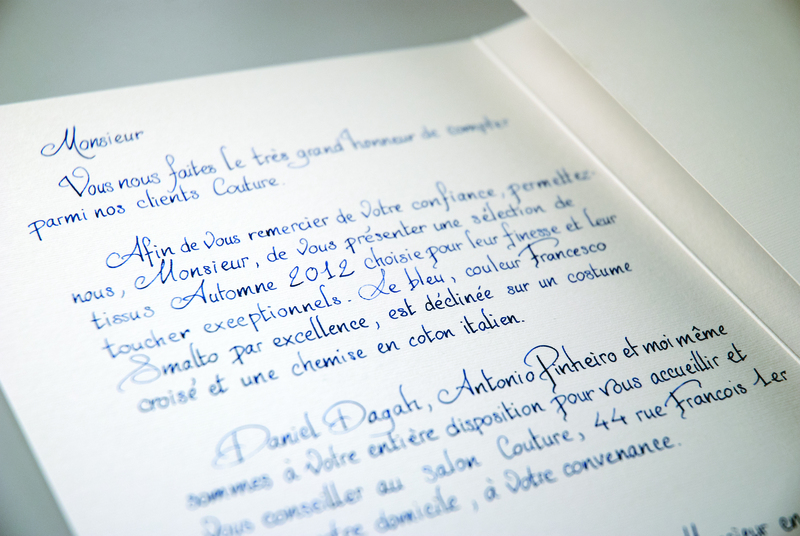 Indeed, for traditional calligraphy, the letters’ form must be extremely specific to be categorized in a style such as « Parisian ». However, modern calligraphy is not totally ignorant of traditional rules. Indeed, for aesthetics reasons, it is often just a variant of an existing writing. For example, an “O” may be flattier or have a loop that goes lower than its traditional twin letter. It is also possible to mix two styles of writing to create a new one. For example, it is possible to use a certain style for capital letters and another one for lower case. Nowadays it is important to emphasize that writing is less and less present in our daily lives. The advent of digital and the internet encourages the “automation” of our connections. This enhances even more the prestige and the importance of the calligraphy message, because it is literally exceptional. 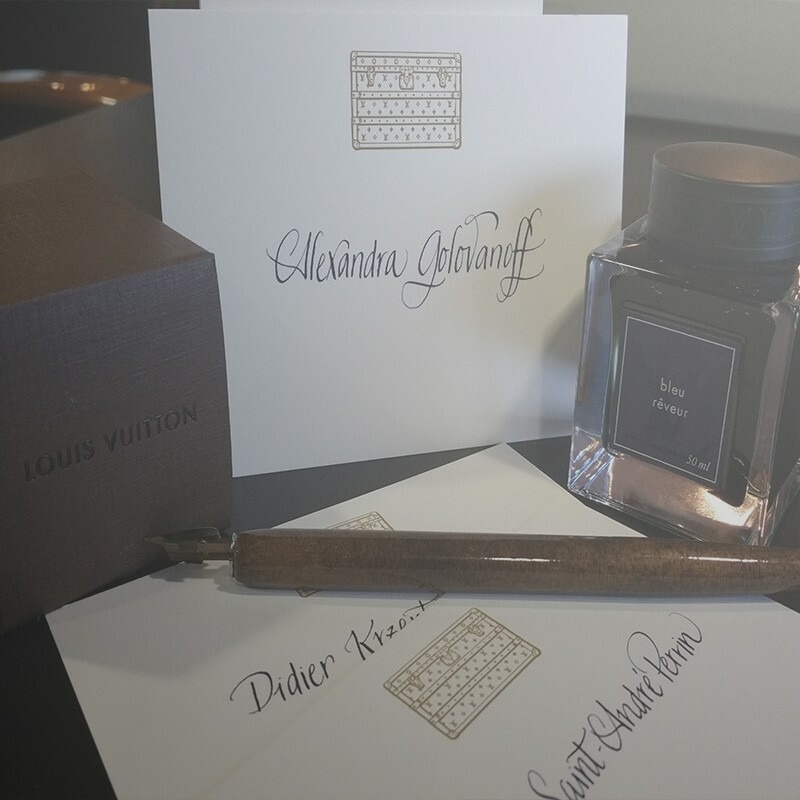 Similarly, the use of calligraphy is an excellent way to value the recipient, the latter feeling flattered or at least touched by a such delicate attention.